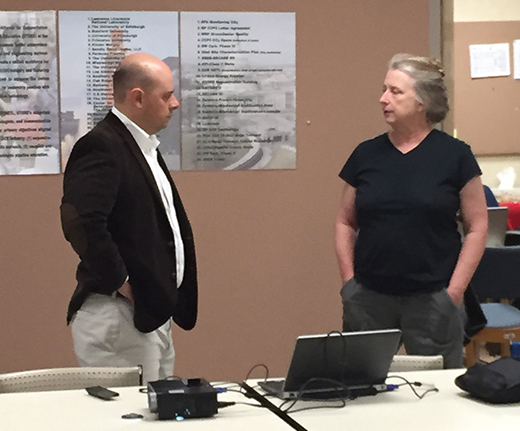 December 14, 2015: Darin Damiani, Carbon Storage Program Manager for the DOE Office of Fossil Energy, invited Vanessa Nunez-Lopez to give a presentation of her project titled "Carbon Life Cycle Analysis of CO2-EOR for Net Carbon Negative Oil (NCNO) Classification" during the interagency CCS meeting. This is a meeting where the DOE, USGS, US EPA, DOJ, and BOEM meet from time to time in Washington to keep each other informed about events and issues related to CSS. The work was presented via Webex. 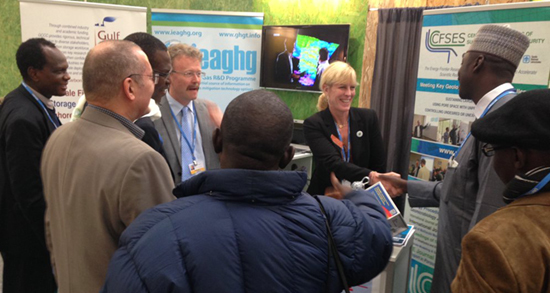 Katherine Romanak meets with climate delegates from around the world at the exhibit booth on carbon sequestration. November 12-16, 2015: Invited Visit by Dr. Di Zhou. Since 2014, the US Department of Energy, Office of Fossil Energy has presented Awards to two distinguished Chinese scholars who champion the development of technologies related to pollution control and carbon management. These awards enhance global recognition of their achievements, their effectiveness within China, and their collaboration with the U.S. via information sharing and project development. Dr. Di Zhou is one of this year's Awardees, and has received an invitational speaking tour to the United States, where she will meet with current and future collaborators and also share her knowledge with a diverse set of audiences across the country. 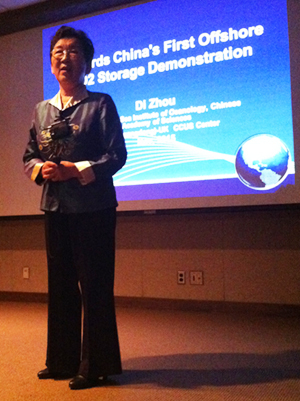 As part of the speaking tour, Dr. Zhou visited the GCCC and gave several presentations. 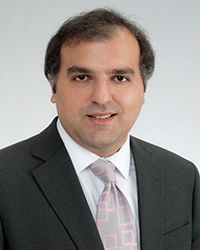 In the past two decades, numerous energy-related research, development and demonstration initiatives have been successfully implemented between the U.S. and China via bilateral agreements and multilateral engagements, such as the fossil energy Protocol between DOE and China's Ministry of Science and Technology, the Carbon Sequestration Leadership Forum, the Clean Energy Research Center (CERC), and the CCUS initiative under the U.S. – China Climate Change Working Group. These efforts have promoted research and development, information sharing, and other technical cooperation. In the last few years, China has recognized the urgent need for pollution control and carbon management of existing power plants and coal conversion plants. It has intensified efforts to enforce regulations limiting emissions from these plants. Guangdong, one of the five "Low Carbon Pilot Provinces" in China, has set a carbon reduction target higher than nation's average. A China-UK collaborative study confirmed the necessity of implementing CCUS in Guangdong in order to meet this target. The study developed a CCUS roadmap for Guangdong, which proposes a million-ton full-chain CCUS demonstration project as the key first step. The study also demonstrated that while inland Guangdong is not suitable for CO2 storage, the the Pearl River Mouth Basin (PRMB) offshore Guangdong in the northern South China Sea is a robust storage target. In parallel to a study of CO2 capture from a power plant, a study of offshore CO2 storage has focused on seeking a suitable storage site in the PRMB. Prime targets are near depleted oil fields, as such fields provide savings both in cost and in time. By scoring and ranking producing oil fields in the PRMB, three candidate sites have been short-listed. Knowledge gaps in final site selection have been identified, including those in CO2-EOR potential, containment quality, and facility reuse. These and future studies are now summarized under the title of the Guangdong CCUS Project, which has been carried out with international collaborations and received financial support from UK SPF and the GCCSI. In late 2013 the UK-China (Guangdong) CCUS Center was established. Recently the Guangdong CCUS Project has been listed in the U.S.-China Working Group on Climate Change. Dr. Di Zhou was granted bachelor in 1965 from the South China Industrial University and a Ph.D. in 1984 from Kansas University. Since 1985, she has worked in marine geology and mathematical geology in the South China Sea Institute of Oceanology. She served as the Vice Director of the Institute and Chairman of the Scientific Steering Committee of the Institute, Council Member of the International Association for Mathematical Geologists, and Secretary of the International Committee of Quantitative Stratigraphy. She served as a Member of the Standing Committee and a Vice Chairman of the Committee for Population, Resources, and Environment in the Guangdong Provincial Political Consultant Committee. In 2003-2005 Dr. Zhou worked as one of the lead authors of Chapter 5 of the IPCC Special Report "Carbon Dioxide Capture and Storage." In 2006 she organized the first Clean Development Mechanism and CCS workshop in Guangdong Province. From 2009 to 2013, she led the first two research projects on CCS feasibility in Guangdong Province and since 2014 she has served as the Vice Chairwoman of the Consultant Committee of the UK-China (Guangdong) CCUS Center. November 6, 2015: GCCC was pleased to host a visit by Dave Malloy, Vice President of Research at the University of Regina in Saskatchewan, Canada. Dave is engaged in the University Network being set up by SaskPower to share the learnings from their Boundary Dam CCS project. This consortium will include research in storage and all aspects of CCS. GCCC discussed avenues of collaboration and looks forward to more productive interaction as the project gets underway. October 26, 2015: Congratulations to Ana González-Nicolás and Luca Trevisan who have just published new papers on carbon sequestration. Ana is the lead author on the paper, "Detection of potential leakage pathways from geological carbon storage by fluid pressure data assimilation", published in the journal Advances in Water Resources. The work proposes an inverse modeling method based on fluid pressure measurements collected in strata above the target CO2 storage formation, which aims at identifying the presence, the location, and the extent of possible leakage pathways through the caprock. Luca is lead author on a new paper published in Water Resources Research titled, "Experimental analysis of spatial correlation effects on capillary trapping of supercritical CO2 at the intermediate laboratory scale in heterogeneous porous media." The work presents the results of an experimental investigation conducted in a synthetic sand reservoir developed to study geological heterogeneity at the intermediate (cm-to-m) scale. Capillary trapping performance was evaluated for three scenarios and x-ray attenuation was used to precisely measure phase saturation throughout the flow domain. October 6-10: Masaryk University. Susan Hovorka participated in a CCS educational series giving two talks on US and RCSP progress and participating in a student workshop. The workshop was funded by Norway. Brno, Czech Republic. October 8, 2015: Forty-three CCS scientists submitted an open letter to Ms. Christiana Figueres, Executive Secretary of the United Nations Framework Convention on Climate Change with assurances that CCS is secure and safe and critical to climate change mitigation. Susan Hovorka, Tip Meckel, and Katherine Romanak were among the signatories. 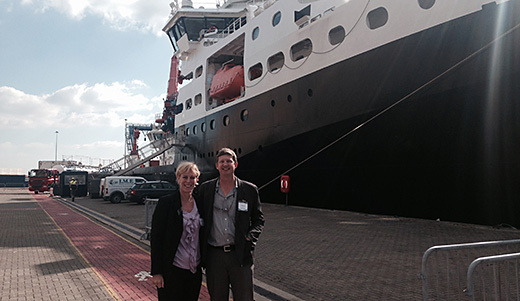 Romanak and Meckel in front of the RV Discovery at the National Oceanography Centre in Southampton. 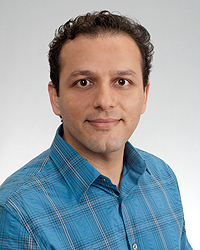 September 21, 2015: Congratulations to Seyyed Hosseini and colleagues at GCCC and GE Global Research who have received an award for a new project from DOE-NETL called "Pressure Management and Plume Control Strategies through a Brine Extraction Storage Test at the Devine Test Site." The project will test active brine extraction wells, passive pressure relief wells, and combinations of both, to control the pressure buildup in the storage formation. Under each pressure management strategy, a complete life-cycle analysis for brine, along with brine handling strategies, will be developed. The proposed study will include some lab and pre-pilot scaling work to obtain the design parameters for Phase II. The proposed field site is the University of Texas at Austin's Devine test site. 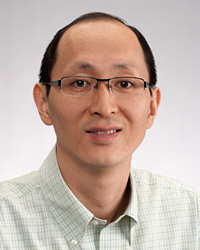 August 17, 2014: Congratulations to Alex Sun, whose project "Development of a Framework for Data Integration, Assimilation, and Learning for Geological Carbon Sequestration (DIAL-GCS)" has been selected by the Department of Energy to receive funding through its Carbon Storage Program. The program advances the development of validation technologies that enable safe, cost-effective permanent geological carbon storage. DIAL-GCS will develop an intelligence monitoring system for automating GCS by allowing for the assimilation and analysis of heterogeneous data in a timely manner. 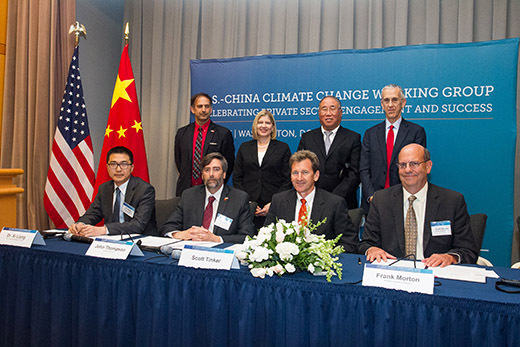 The system's capabilities will be assessed using data from the SECARB Stacked Storage project at Cranfield, MS.
Officials from China and the United States met in Washington D.C. as part of the U.S.-China Strategic and Economic Dialogue (S&ED), which builds on the historic announcement last November in which the two countries pledged to work together to decrease carbon dioxide emissions. During the S&ED's climate change panel, Secretary of State John Kerry described enormous opportunities for the collaboration, and made special mention of carbon capture and storage. Energy Secretary Ernest Moniz told reporters that the U.S. and China would cooperate with "unparalleled scientific activity" to develop CCS in saline aquifers. The Gulf Coast Carbon Center's significant expertise, both in the field and in the lab, has been tapped for this effort. At the meeting, BEG Director Scott Tinker, representing the GCCC, signed a Memorandum of Understanding of collaboration and knowledge sharing with the UK-China (Guangdong) CCUS Centre, Southern Company, and Clean Air Task Force. Guangdong's integrated carbon capture and offshore storage project proposes to capture post-combustion CO2 from China Resources Power's Haifeng coal fired power plant for offshore geologic storage and enhanced oil recovery in China National Offshore Oil Company's oil and gas fields in the Pearl River Mouth Basin. 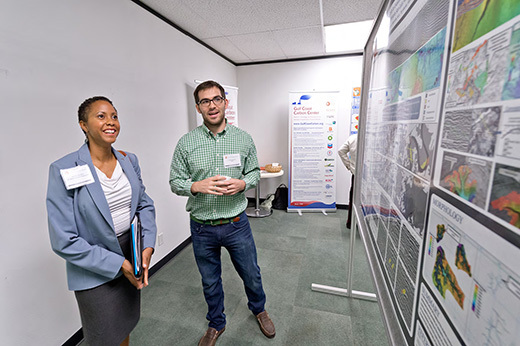 Geological carbon storage in the Texas offshore, championed by GCCC researchers, is proposed as a counter-facing project for China's offshore project. 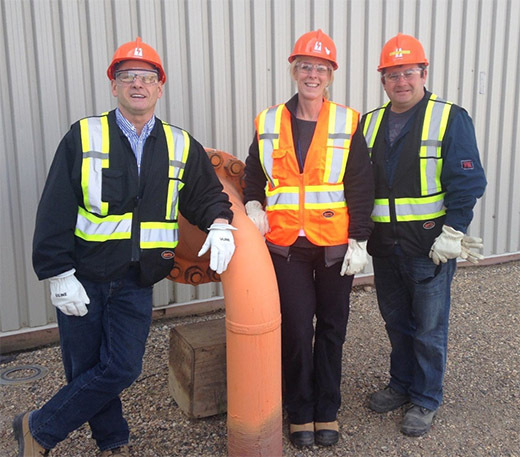 The absence of smoke at the second smokestack from the left at SaskPower's Boundary Dam project is evidence of CCS. June 8, 2015: GCCC researchers Changbing Yang, Susan Hovorka, Ramón Treviño, and Jesus Delgado-Alonso have just published a new paper in the journal Environmental Science and Technology titled "An Integrated Framework for Assessing Impacts of CO2 Leakage on Groundwater Quality and Monitoring-Network Efficiency: Case Study at a CO2-EOR Site." This study presents a method for combining site characterization, laboratory experiments, single-well push-pull tests, and reactive transport modeling to assess potential impacts of CO2 leakage on groundwater quality and leakage detection ability of a groundwater monitoring network in a potable aquifer at a CO2 enhanced oil recovery site. June 4, 2015: GCCC researcher Akand Islam has released an Android app called CO2Thermo that quickly provides CO2 thermophysical properties. 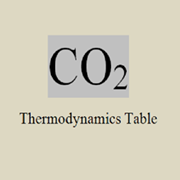 This app calculates essential thermodynamic properties of CO2 including solubility of CO2 in water (g/L), compressibility factor, density (kg/m3), enthalpy (KJ/Kg), internal energy (KJ/Kg), entropy (KJ/Kg/K), Helmholtz energy (KJ/Kg), and Gibbs Free Energy (KJ/Kg) for given temperature (C) and pressure (bar). Audiences for this app are academic educators and students in the fields of chemical, mechanical, and petroleum engineering; physics; chemistry; and geoscience, as well as researchers and professionals working in the fields of CO2 sequestration, CO2 based geothermal energy, up- and mid-stream oil and gas operations, and other applications where CO2 is used as a working fluid.Please click to download the app. June 3, 2015: Big congratulations to JP Nicot for his acceptance as a Fellow of the Geological Society of America. A GSA Fellowship is an honor bestowed on the best of in the geosciences profession once per year at the spring GSA Council meeting and is recognized at our yearly Annual Meeting. GSA members are elected to Fellowship in recognition of distinguished contributions to the geosciences. June 2, 2015: Congratulations to a number of GCCC staff who received recent promotions. JP Nicot was promoted to Senior Research Scientist. Changbing Yang and Katherine Romanak were promoted to Research Scientists, as was GCCC collaborator Tongwei Zhang. We salute you for your excellent contributions not just to the Gulf Coast Carbon Center, but to The University of Texas at Austin, and the CCS community. May 22, 2015: Congratulations to our Graduates! 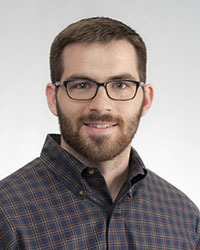 Michael Patson received a Masters degree for his thesis titled "The behavior of dissolved organic carbon (DOC) at geological sequestration sites." This research project was funded by the GCCC and the results help understand how DOC in shallow groundwater may be affected in the event of small or large-scale CO2 leakage from CO2 sequestration sites. 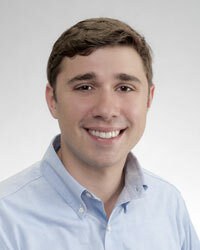 Michael is currently working as a geologist at Cimarex Energy in Tulsa, Oklahoma. Francis Mulcahy completed requirements for a Masters degree with his thesis, "Use of High Resolution 3D Seismic Data to Evaluate Quaternary Valley Evolution History during Transgression, Offshore San Luis Pass, Gulf of Mexico," working with data collected by the GCCC's state-of-the-art P-cable as part of the Offshore Miocene project. Francis is now employed at Statoil, Houston working on petroleum exploration in the Gulf of Mexico. 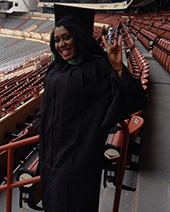 Prisca Ogbuabuo received her Masters degree for her thesis, "The Role of Methane in Limiting CO2 EOR: Case Study of Offshore Gulf of Mexico Reservoirs." Prisca helped to develop a best management practices manual for sub-seabed geologic carbon dioxide (CO2) sequestration on the U.S. outer continental shelf through analysis of (1) the applicability of existing regulations to offshore sub-seabed geologic sequestration, (2) injection of CO2 on the OCS for enhanced oil recovery (EOR) with incidental CO2 storage, and (3) long-term storage of CO2 without the added financial benefit of EOR. May 20, 2015: Congratulations to Akand Islam, Tad Patzek, and Alex Sun, who have just published "Thermodynamics phase changes of nano pore fluids" in the Journal of Natural Gas Science and Engineering. The goal of the work is to compute pressures exerted by the fluid molecules and to investigate how they change due to pore proximity by assuming the pore wall is inert. The results clearly show the phase changes due to confinement. The critical shifts of temperatures and pressures are in good agreement compared to the laboratory data and molecular simulation. This work provides insights into the nature of fluid behavior in extremely low-permeability nanoporous media, especially in the tight shale reservoirs, below the critical temperatures. May 15, 2015: We are delighted to announce the release of EASiTool 2.0 to the public and research community. This analytical simulation tool provides reliable estimation of storage capacity for any formation. It has been developed for technical and non-technical users with minimum engineering knowledge. For more information about EASiTool and for free download, please click here. 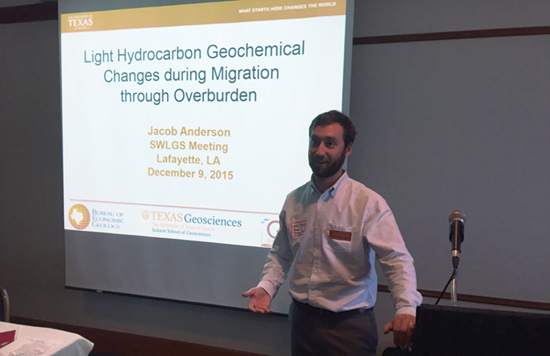 Jacob Anderson speaks with industry representatives about his research. Francis Mulcahy speaks with industry representatives about his research. 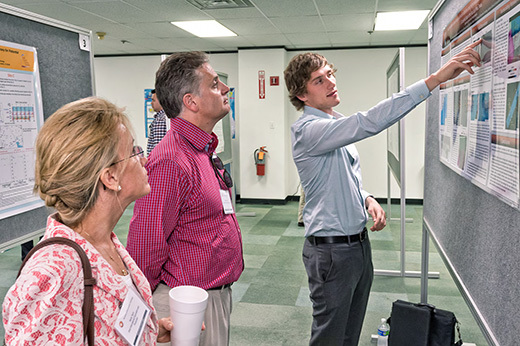 Jonathan Osmond speaks with industry representatives about his research. 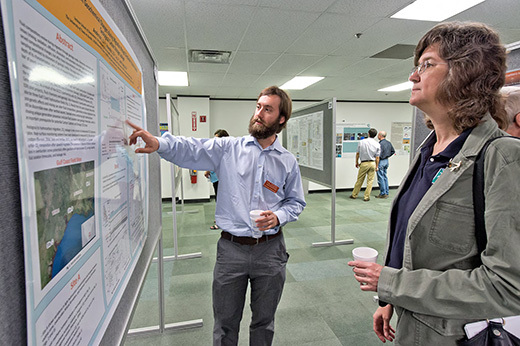 April 23, 2015: At its annual First Author Publication Awards Dinner, the Bureau of Economic Geology paid tribute to researchers who were first authors of papers published in 2014. Thirty-six first authors were recognized at this year's event, eight for the first time. GCCC post-doc Akand Islam had the most first-author publications in 2014, with a remarkable five articles. Congratulations Akand! 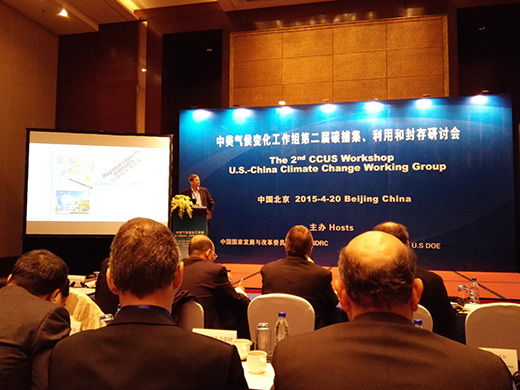 April 18-23, 2015: In support of the CCUS initiative of the U.S.-China Climate Change Working Group, Tip Meckel, Susan Hovorka and Jiemin Lu attended a series meetings and workshops in Beijing, Shanwei, and Guangzhou in China. One of the primary purposes of the visit was to attend the 2nd CCUS workshop of U.S.-China CCWG in support offshore CCUS in Gulf of Mexica and Guangdong offshore as potential counterfacing U.S.-China CCUS projects under CCWG initiatives. The other major objective is for Gulf Coast Carbon Center to establish working relationship with various Chinese research groups and industrial partners who are involved in potential offshore CCUS project in Pearl River Basin offshore Guangdong Province. The focus of GCCC efforts was to facilitate technical transfer with U.K.-China (Guangdong) CCUS Center to support the development of offshore CCS demonstration projects in both countries. Susan Hovorka called the trip both productive and prestigious. During the workshop, Tip Meckel gave a talk, "U.S. Offshore CO2 Storage," which was followed by discussion with experts from China about ways to further collaborate and to develop strategies to promote Guangdong Offshore CCUS. Susan Hovorka gave a talk entitled "Critical role of reservoir characterization in CO2 EOR flood design" and discussed the potentials of modifying CO2 flood design according to reservoir properties to improve production performance at the Research Institute of Petroleum Exploration and Development (RIPED), PetroChina, in Beijing. 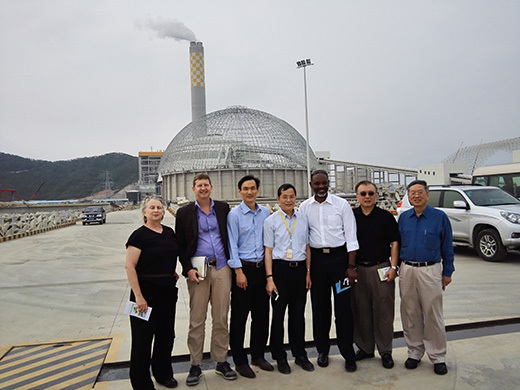 The group also toured the Haifeng Power Plant of China Resources Power in Shanwei, Guangdong. Sue Hovorka, Tip Meckel and Jiemin Lu also presented GCCC's research on the past DOE-funded CCS projects at the South China Sea Institute of Oceanology, Chinese Academy of Sciences, Guangzhou, Guangdong. The trip was facilitated and hosted by the US Department of Energy. GCCC researchers (L to R) Susan Hovorka, Tip Meckel, Jiemin Lu, and Heping Zhu, Deputy Director of Technology, China Resources Power; a member of the U.S. counsulate; Samuel Tam, China Chief Representative, U.S. Department of Energy, and Dr. Ming Sung, Chief Representative, Asia Pacific, Clear Air Task Force at the Haifeng Power Plant of China Resources Power. 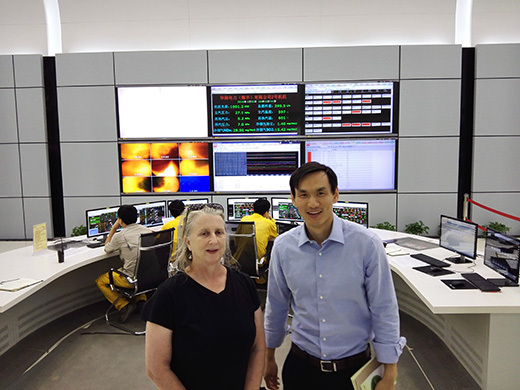 Susan Hovorka and Jiemin Lu visit the control room at the Haifeng Power Plant of China Resources Power. Tip Meckel presents GCCC's work on offshore CCS at the 2nd CCUS workshop of the U.S.-China Climate Change Working Group. April 14, 2015: Congratulations to Akand Islam and Alexander Y. Sun who have just published the paper, Quantification of CO2 masses trapped through free convection process in isothermal brine saturated reservoir in the International Journal of Heat and Mass Transfer. The paper investigates dissolution trapping of supercritical CO2 into formation brine as a potential mechanism for reducing buoyancy force in carbon storage formations. This study attempts to quantify how much CO2 can be stored through dissolution trapping assuming the free-phase CO2 will be dissolved continuously on the top of perturbed brine phase. Most former investigations focused on physical explanations of density-driven free convection instability. The aim of this paper is to compute the amount of CO2 (by mass) captured by dissolution trapping until the model reservoir reaches steady state. On average, the simulations performed show that 0.33 – 15 g CO2 will dissolve per year until a heterogeneous unit reservoir volume of 1 m3 reaches complete saturations. For the case of homogeneous reservoir this amount is 0.28 – 6 g.
March 11, 2015: SECARB 10th Annual Stakeholder's Briefing. Changbing Yang presented "Outcomes and Lessons Learned from Groundwater Monitoring." 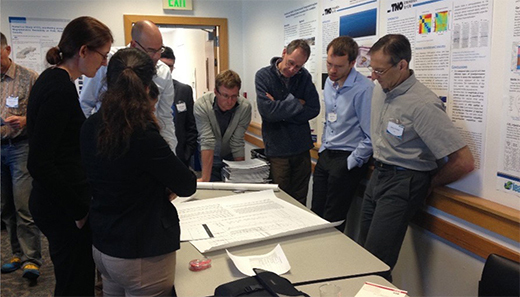 Lucie Costard presented "Near Surface Stratigraphy and Geophysics." At this site, like others studied, CO2 added to the aquifer does not release any hazardous constituents. The best analysis for detecting if CO2 has entered the aquifer is dissolved CO2 and dissolved inorganic carbon (DIC). In a natural system with natural variability, the change from CO2 entering the aquifer cannot be detected far from the leak point. 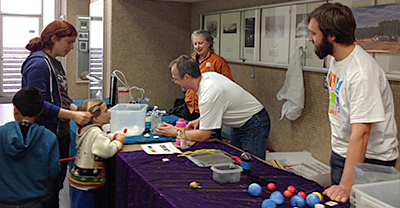 Susan Hovorka (Left) and Jacob Anderson (Right) make invisible CO2 real for a young visitor. March 7, 2015: Explore UT: The Biggest Open House in Texas. GCCC staff participated in the annual expo, which spans the entire Forty Acres, hosting 500 busloads of students who arrive for a day full of fun and learning. GCCC activities developed by Susan Hovorka included "Find Gold" and "What to Do About CO2." The torpedo-shaped instrument on the left side of the vessel is the lead head weight that pushes pipe into the sediment for coring. February 21-22, 2015: Dr. 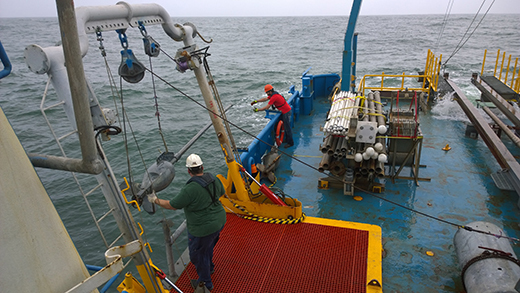 Tip Meckel led a coring operation in the inner Texas shelf offshore Galveston Island. The study site was previously imaged in 2013 by Meckel and his collaborators using the UT Bureau of Economic Geology's high-resolution 3D seismic (Pcable). Seismic interpretations indicates that there is a deep-seated gas chimney at the site and identified a suite of shallow seismic anomalies at a depth 10 to 40 meters below the seafloor. These anomalies have been interpreted to be shallow free gas accumulations. The goal of this core sampling is to determine if the gas anomalies can be identified and resolved with the fine spatial detail imaged in the seismic data. The dataset provides important information for monitoring strategies for the future potential for offshore storage of CO2 in the stratigraphy beneath the offshore State Waters. February 9-11, 2015: The 5th Korea International CCS Conference. Toti Larson attended the conference on Jeju Island, South Korea and presented a talk, "Using coupled models and experiments to understand complex geochemistry of CO2 storage and transport of fugitive gases and fluids." He engaged in fruitful discussions with KCRC Director Dr. Sang-do Park and assistant Dr. Hwansoo Chong who are involved in the planning of onshore pilot CCS projects and commercial-scale offshore projects for the Korea CCS 2020 project. With assistance of GCCC Sponsor KCRC and Dr. Hunsoo Choi, Director of Geochemical Monitoring at KIGAM, which is a research group developing technologies for capture, transport and storage of CO2, Dr. Larson was also invited to speak about his work related to gas transport in the subsurface at the KIGAM research center in Daejeon City, South Korea. Toti Larson speaks at the 5th International CCS Conference, and enjoys traditional Korean BBQ with KIGAM scientists: Kwon Gyu Park, Jeong Chan Kim, Young Jae Shinn, Hunsoo Choi, and Gutak Chae (Kue-Young Kim photo credit). February 3, 2015: The Huffington Post published a piece by science writer Juli Berwald, who covers GCCC activities. The article is based on a GCCC blog by Tip Meckel, about the possibility of mitigating Keystone-XL pipeline emissions using CCS on the Gulf Coast. February 2, 2015: Asia-Pacific Economic Cooperation (APEC) Workshop for CCS Capacity for Mexico and China. Vanessa Nunez was invited to speak. Kemper, MS.
January 26-30, 2015: International Organization for Standardization (ISO). Susan Hovorka participated in a meeting, which seeks to bring together experts from around the world to develop international standards for standardization of CCS. Birmingham AL. January 26, 2015: Tip Meckel is the lead author with Steve Bryant and Ravi Ganesh on a new paper in the International Journal of Greenhouse Gas Control, "Characterization and prediction of CO2 saturation resulting from modeling buoyant fluid migration in 2D heterogeneous geologic fabrics" (link). The paper quantifies saturations for a broad range of clastic facies and depositional architectures, presents a two-dimensional invasion percolation saturation predictor model, validates IP predictor model with natural geologic specimens and field example, and provides implications of saturation variability for capacity estimation and seismic imaging. 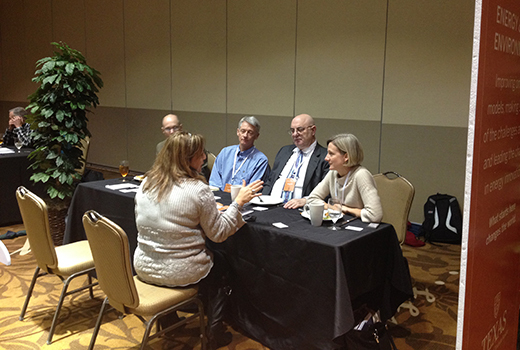 From left to right, Charles Werth, GCCC's JP Nicot, David Eaton, and Sheila Olmstead speak to an Austin-based reporter. January 22, 2015: Legislative Media Open House for Texas Journalists. 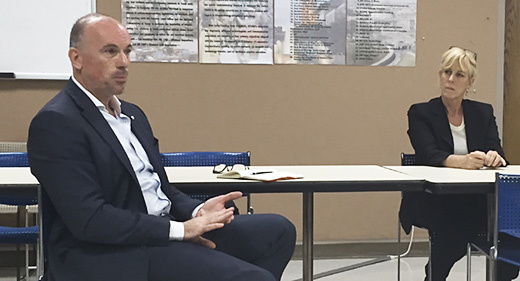 Katherine Romanak and JP Nicot participated in an open house organized by The University of Texas at Austin aimed at providing the media with expert technical information on legislation that may be proposed in the upcoming session. Austin TX. 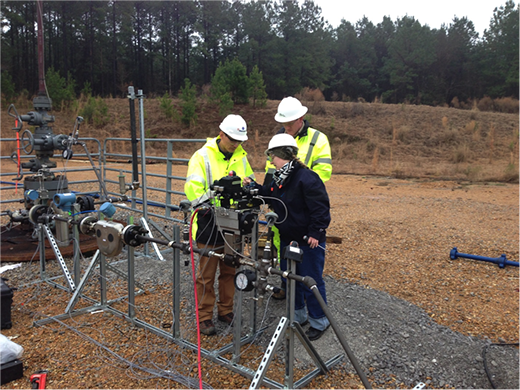 From left to right, Jiemin Lu, Paul Cook (LBL), and Kate Hart (EchoGen) test the controlled release system. Photo courtesy Dr. Barry Freifeld. January 18-31, 2015: Alex Sun and Jiemin Lu led an experiment to demonstrate the efficacy of a harmonic pulse testing (HPT) technique for monitoring potential leakage from geologic carbon sequestration formations. HPT is a pressure-based, active monitoring technique for detecting the presence of leaks by modulating the injection pattern and monitoring observation well pressure responses. Because an actual example of well failure did not exist, the field project created a controlled release in order to simulate this negative event. The study site included a CO2 injector and two observation wells located approximately 300 ft and 400 ft away. During the experiments, the observation wells were instrumented with high-resolution pressure gauges. Controlled CO2 venting was engineered from one of the observation wells to simulate the worst-case leakage from the reservoir. Square pulses of different period lengths were imposed at the injector by maneuvering the wellhead choking valve. Preliminary analyses of pressure data show promising results. The field experiment was funded by DOE and NETL and coordinated with SECARB. It was conducted in collaboration with a team from the Lawrence Berkeley National Lab funded under a different project. January 6, 2015: Along with David Bomse of Mesa Photonics, LLC, Katherine Romanak and Changbing Yang have won an SBIR/STTR FY 2015 Phase I grant for approximately $225,000 for their proposal "Real-time, in situ, process-based soil gas analyzer." This technology was born out of CCS monitoring research but is being supported for its overarching scientitifc value for understanding complex terrestrial systems. The proposed project builds on two recent innovations. First, Romanak and her colleagues demonstrated that concentration measurements of four simple gases – oxygen, carbon dioxide, methane, and nitrogen – are sufficient to characterize and potentially quantify important activity in unsaturated sediments and soils including barometric pumping, aerobic and anaerobic biologic activity (respiration, denitrification and methane oxidation), and CO2 and carbonate dissolution. This approach has been demonstrated successfully at playa lakes where there is systematic spatial variability in CO2 formation and consumption, and at several engineered sites where exogenous gases were added to test the robustness of the process-based method. Second, Mesa Photonics demonstrated an all-optical technique for real-time measurements of the four key gases. Although inexpensive commercial sensors are available for CO2, CH4, and O2, measurements of N2 concentrations require expensive, cumbersome equipment that, in some cases, is incompatible with oxygen. This project will lead to commercialization of fully-automated and self-contained soil gas analyzers. Each device will be about the size of a one-gallon container and could be powered by a small solar panel with battery backup.